The wind is an incredibly interesting thing to think about. It is something that is completely invisible to us. We can hear, feel, smell, and even taste it but we can only see what it does to things that we can see. Ultimately it is just air in our atmosphere moving from an area of high pressure to an area of low pressure and that is one of the most important parts of what makes weather possible on Earth. I bring this up because I found an incredibly cool interactive globe last night that shows you the wind speeds everywhere on Earth in real-time. Looking at it zoomed out you’ll observe that the strongest winds at any given time will be over our oceans where there’s no land to get in the way. 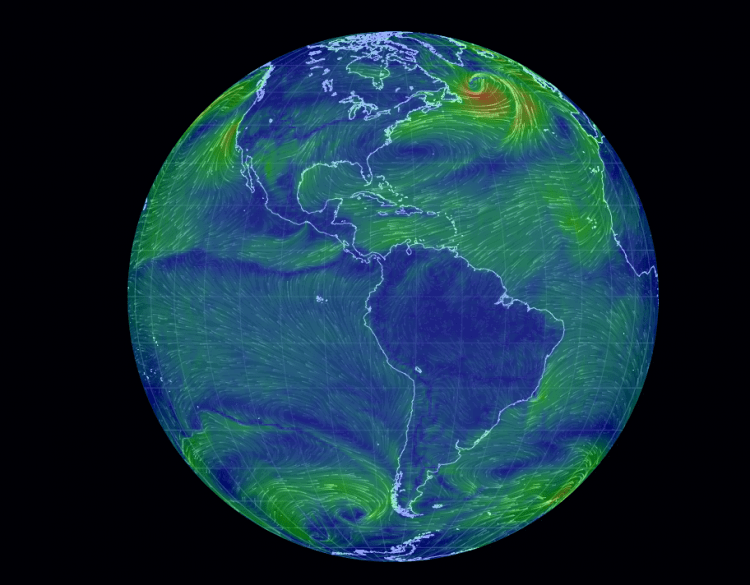 You have to zoom in pretty closely over the continents to actually see how fast the air is moving on land. It is a really fun tool to play around with and it gives you a good sense of what the weather might be like everywhere in the world at the moment. If you want to see something really cool, check out Antarctica.